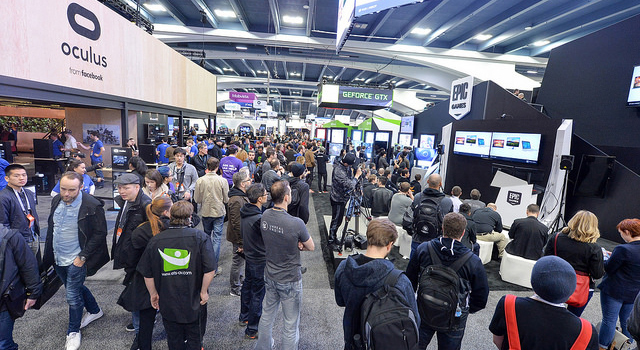 GDC - a single week in March that reminds us how fortunate we are to be in this industry. Impressions might be countless, but here’s a list of our top 5 moments that made GDC 2018 a memorable one. Every year we look forward to the opportunity to deepen our relationship with clients and friends. We hosted over 50 meetings at our office, attended dozens of talks, shared numerous meals and drinks with industry professionals. Being able to show off our latest work to our clients and see their reactions is endlessly rewarding. When it comes to GDC evening hours, it is all fun and games… literally. We had a pleasure of hosting a party for over 200 friends and colleagues at a beautiful downtown venue. The food was plentiful and drinks were flowing as we chatted away with some of the most creative minds in the industry. There are more parties than one could count, but this year we visited our friends from Scopely, Fig, Microsoft, Ringling College of Art and Design, Unity, Pocket Gems, Zynga, Vector Unit, and more. Yes, it took some extra hydrating over the weekend, but we wouldn’t change a thing. In the domain of visual arts, the most notable novelties come from Unreal engine that demonstrated jaw dropping ray tracing technology. Epic games also demonstrated real time digital human that is set to be a precedent in computer graphics. Oculus made quite a statement coming out with their wireless headset affordable to many enthusiasts, Ubisoft announced further expansion, and the number of new games ready to hit the market is seemingly infinite. We’re beyond excited to see it all unfold. This year we were made sure that VR is still doing well, with a lot of people working on new content and technology. It transitioned from a novelty to a standalone pillar. Blockchain has stepped into gaming in a big way. A lot was said about introducing blockchain based assets to players. Another widely discussed topic was potential organizing of US based gaming professionals into unions. Both of these subjects are extremely current and relevant with high potential impact on our community. 5.And of course… The show floor! At the end of the day, this is what it’s all about. Epic Games and Unreal engine made a big statement with a giant booth with people tirelessly playing Fortnite (while others were riding mechanical bulls mere feet away) which was streamed all around. It was quite a spectacle. Another highlight was a VR game Creed: Ride to the Glory that had a full on boxing ring on the expo floor where visitors could see how they would do as Rocky Balboa’s trainer Adonis Creed. The line to try the game was long, but well worth the wait. And there we have it. We at CAH are looking forward to all the projects and collaborations that sparked during the busy conference days. If you haven’t had a chance to say hi last week feel free to send us an email, we are more than happy to answer any questions. © 2019 Concept Art House, Inc.